Bounce Blu-ray Details. 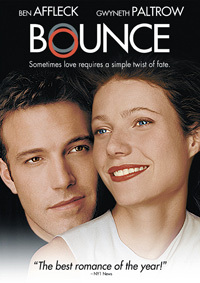 Lionsgate Home Entertainment has revealed the bonus features and release date for Miramax’s Bounce (2000) on Blu-ray. The terrific romantic drama stars Ben Affleck, Gwyneth Paltrow and Natasha Henstridge. You can see the bonus features below. Buddy (Affleck) is a smooth-talking, skirt-chasing advertising executive who is enjoying his high-powered career until a sudden and tragic twist of fate brings him into the life of Abby (Paltrow) a young widow in denial with two kids. Abby lets Buddy into her heart — not knowing that he is, in part, responsible for her grief. MPAA Rating: (PG-13) for some language and sensuality. Buddy Amaral (Ben Affleck), a successful and self-absorbed Los Angeles advertising executive, switches airline tickets with a stranger (Tony Goldwyn) just before boarding a long-delayed flight so that he might enjoy an overnight fling with a pretty Dallas businesswoman (Natasha Henstridge). When the plane goes down, killing all aboard, Buddy’s guilt soon turns into an alcohol problem, As part of his 12-step program, Buddy seeks atonement and decides to seek out the woman he thinks he’s left a widow. When he finds Abby Janello (Gwyneth Paltrow), a beautiful and smart real estate agent and mother of two, the pair fall in love, only to later split when she learns the truth.